Mapping the European Breton Lai is a three-year research project at the School of European Languages, Culture and Society (SELCS) at University College London, based within the Department of French and run by me, Elizabeth Dearnley. I hold a Leverhulme Early Career Fellowship, and the project is funded by SELCS and the Leverhulme Trust. The project traces the journeys across medieval Europe made by Breton lais, short, rhymed stories about love, chivalry and the supernatural which became popular in the later Middle Ages. 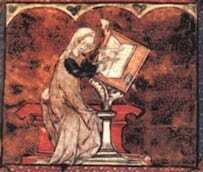 Supposedly based on the tales of the ancient Bretons, lais were first recorded in twelfth-century England, in French, by a woman known as Marie de France. However, over the next 200 years many more lais were written down, initially in French and subsequently in other European languages. My project aims to examine all known surviving lais, focusing on the way in which they were disseminated in manuscripts. In a pre-print manuscript culture, there is the potential for each copy of a text to be slightly different, so I’ll be investigating some of the differences between versions of the same lai. I’m also looking at the sorts of manuscripts which contain lais, which are often miscellanies containing several different types of text, from religious manuals to bawdy fabliaux (short comic tales, usually involving some sort of sexual escapade), investigating whether any sorts of patterns can be found. Do lais travel mostly with other lais, for instance? Or with other types of short narrative? What relationship is there between collections of lais and other story collections (either other medieval ones such as Chaucer’s Canterbury Tales, or much later collections of tales such as those of the Brothers Grimm)?